Wnn Keyboard Lab is seeking business partners. Wnn Keyboard Lab offers basic IME functions as well as plugins and other advanced features for extended applications and contents. We wish to join hands with partners interested in collaborating with us using these advanced features. 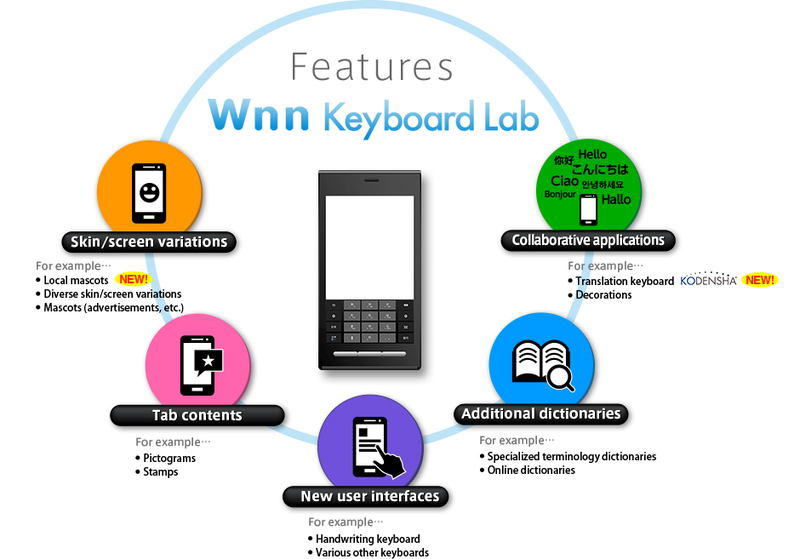 What is Wnn Keyboard Lab? A “data-adaptive prediction function” allows even smoother and easier text entry. Users can add a conversion feature, keyboard image, signal tabs, dictionaries, etc. using plugins. A multilanguage package is planned to be released hereafter, which would allow text entry in different languages with the addition of language-specific modules. iWnnService (for external provision of the iWnn conversion feature) enables the Wnn Keyboard Lab text conversion feature to be used in other applications/IMEs.